Thursday July 31st Radio Nashville rocks the Blake Shelton After-Party at Ballys Mountain Bar in Atlantic City, NJ, right after the free Concert on the Beach, you have to win tickets (details Below), then Radio Nashville will play right after inside Ballys in the Mountain Bar, it’s gonna be a Party !!!! ATLANTIC CITY — Bring your beach blankets, flip-flops, sunscreen and an appetite for summer fun — and don’t forget your free tickets — as superstar music acts Blake Shelton (Thursday, July 31) and Lady Antebellum (Sunday, Aug. 3) hit the Atlantic City beach (between The Pier Shops at Caesars at Arkansas Avenue and Central Pier at St. James Place) for an unforgettable Atlantic City summer weekend experience. The Atlantic City Alliance (ACA), in conjunction with Live Nation and DO AC, today announced that after finalizing the site plan more concert tickets have become available. An additional limited block of free tickets to each beach concert can be reserved via Ticketmaster.com beginning Friday, July 11 at 3 p.m. Although the beach concerts are free, tickets are required to gain entry on to the free beach concert site. There are no TicketMaster fees, but tickets are limited to two per person. In addition, the DO AC Nightclub on Wheels will be popping up randomly over the next two weeks, giving away another 1,000 tickets to each concert in Baltimore on July 16, Philadelphia on July 23 and New York City on July 24. These pop-ups will be the final opportunity to score tickets to the free Beach Concerts with Blake Shelton and Lady Antebellum. 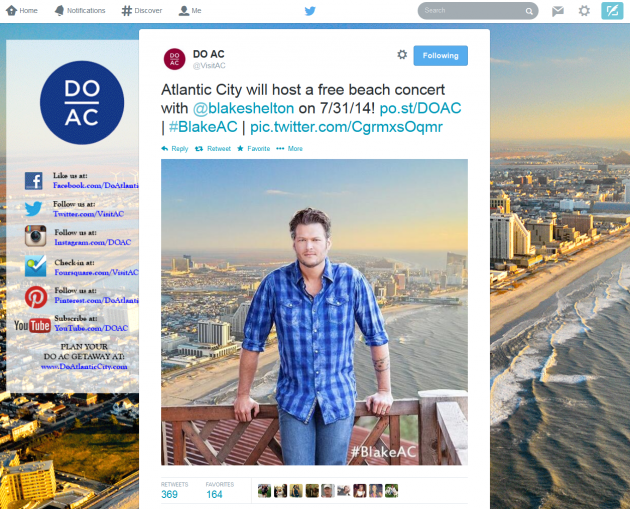 Follow the hashtags, #BlakeAC and #LadyAinAC for more information. Another way to win tickets is through contests on Facebook. Like and follow www.facebook.com/DOAtlanticCity to learn more details as contests are announced.